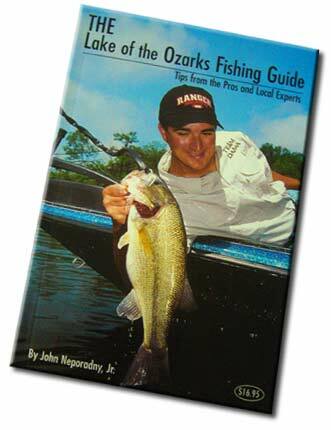 THE OFFICIAL LAKE OF THE OZARKS FISHING GUIDE BOOK. THE Perfect birthday gift for anglers who already have all the the tackle they need! Outdoor Writer John Neporadny has written two fishing books—one on how to fish his home waters of Lake of the Ozarks and the other providing 101 bass fishing tips from the top touring pros. 1. THE Lake of the Ozarks Fishing Guide compiles the best techniques for fishing one of the most popular lakes in Missouri. The guide is filled with 180 pages of tips from the pros and local experts on how to catch black bass, crappie, white bass and catfish at the Lake of the Ozarks. Numerous photos, maps of each section of the lake and information on lodging, access areas and marina locations are also included in the book. The guide also has a special chapter on how touring bass pros Denny and Chad Brauer and Guido and Dion Hibdon and crappie pro angler Tony Edgar fish their home waters throughout the year. Another chapter covers Bass Tournament Winning Patterns, which reveals how Central Pro-Am, Wal-Mart BFL and Bassmaster events have been won since the 1990s. Guaranteed to help you make critical decisions on fishing at Lake of the Ozarks. Don't Delay, ORDER yours today. 2. 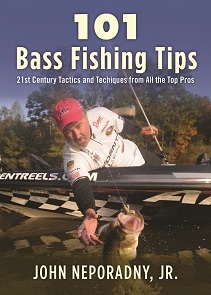 101 Bass Fishing Tips Twenty-First Century Bassing Tactics and Techniques from All the Top Pros. John Neporadny has spent over twenty years covering elite bass tournaments, and his access to all the top professionals gave him a unique opportunity to absorb their best tricks of the trade, collected in the new book 101 Bass Fishing Tips: Twenty-First Century Bassing Tactics and Techniques from All the Top Pros (Skyhorse Publishing, August 2013). In 101 Bass Fishing Tips, the best competitors of the Bassmaster and FLW circuits share their secrets on how to catch largemouth bass throughout the year on various bodies of water. No detail is too small, including the information on selecting the right tackle and lures so you can fish just like the pros. Bass fishing's elite anglers also discuss how to find fish on structure such as drop-offs, ledges, points, and flats, and describe their tricks for coaxing bass out of weeds, bushes, stumps, and other types of cover. Beginners and advanced anglers alike will discover a load of valuable information they can apply on their favorite waters to catch America's most popular game fish. Full of information and great stories, 101 Bass Fishing Tips is the best guide available to help fishermen land more bass and is a revealing look at the exciting world of professional fishing. Order your personalized, autographed copy today.